"I still go to the markets because I love talking to people about food." On a quiet stretch of the Marys River just outside Corvallis in the tiny town of Philomath, John Eveland (top photo) and his wife, Sally Brewer, are running a certified organic farm on a combination of rented parcels and land that's been bought from neighbors over the past 27 years. 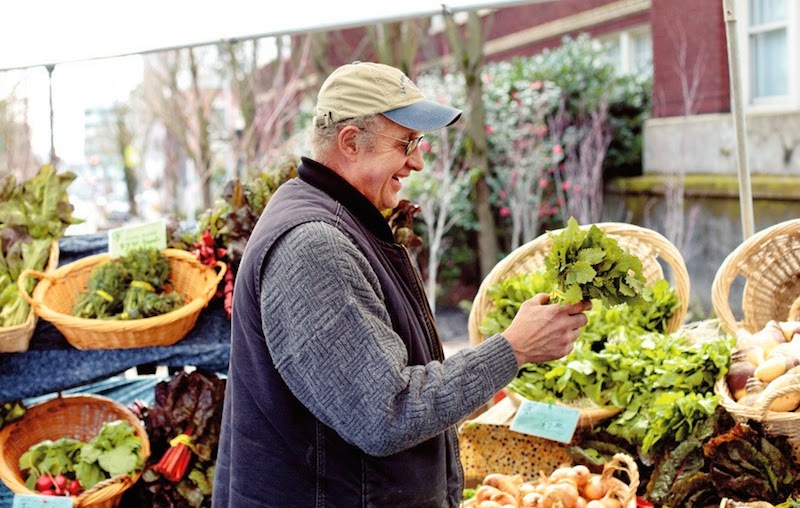 John estimates that in 2014, total sales at their Gathering Together Farm will top two million dollars between 12 farmers' markets—three in Corvallis, six in Portland, the Beaverton Farmers Market and two at the coast—a year-round CSA, wholesale customers, restaurant customers and the farmstand and restaurant on the property. John and Sally don't get to keep all that money, of course, since, aside from hard costs, at the peak of harvest season John signs 128 full and part-time paychecks every month and even in the slower winter months he employs a crew of 40. The farm has two managers, Rodrigo Garcia and Joelene Jebbia; a chef, J.C. Mersmann, who runs the farm restaurant and catering arm; as well as an HR department. All this started on just two acres of land in 1984. It wasn't meant to be more than that, originally, just enough to supply the vegetarian restaurant, Nearly Normal's, that John, his first wife and three friends started in Corvallis in 1980. Dissatisfied with the quality of vegetables they could get from distributors, a group of them decided to try to become farmers and grow their own. The other partners found it a bit more of a commitment than they anticipated and dropped out, leaving John and his first wife (and eventually him and Sally), to manage the new farm on their own. Year-round markets were a game-changer. John said that, unlike today when we have a rainbow of heirloom vegetables to choose from, back in those early days carrots came in one color, orange, and tomatoes were big red slicers, mostly beefsteaks. 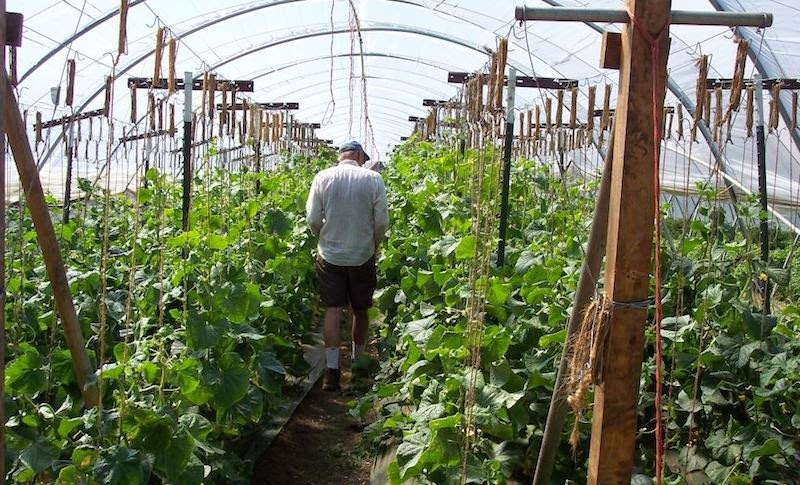 From the beginning the farm used hoop houses, a series of plastic-covered hoops set over rows of crops, to extend their growing season, but things would pretty much shut down in November until planting season began again in January. "The game has changed with winter markets," he said, and more varieties of cold-tolerant crops that do well in the maritime Northwest made it possible to keep plants in the ground through the winter. But what really pushed Gathering Together Farm into its current year-round status was that his crew needed full time employment to stay in the area, so the farm now grows leeks ("They're bullet-proof," Eveland said. ), turnips, rutabagas, parsnips, kale and a popular winter salad mix, with more added every year. 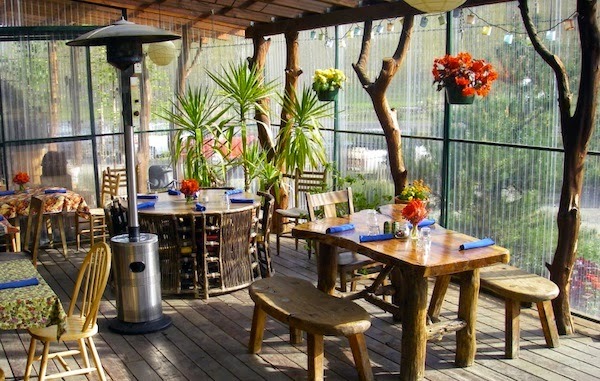 The covered patio at the restaurant at the farmstand. Plus, he said, "People are a lot more sophisticated in terms of their taste and what they're looking for." Unlike the old days where shoppers would turn up their noses at root vegetables or anything that wasn't a standard shape, he said they're now willing to try new things and buy non-uniform vegetables. And for those crops that might have blemishes but are otherwise perfectly good to eat, the farm has developed what are called "value-added" products like salsas, jams, pickles and sauces. Delicatas are perfect for soup (recipe below). Now pushing 66 years old, Eveland laughed and said he plans to be out in the field until he drops. Turning momentarily serious, he said that it's been critical to develop a staffing structure that provides a pool of expertise and knowledge to keep the farm humming along, especially since he considers himself "a creator, not a maintainer." Reflecting on nearly three decades of farming, Eveland said it's certainly a much bigger, more complex farm than he would have ever dreamed of back in those early days. "We're proud of what we've created in the community and the reputation we've earned," he said. "I just hope we've created something solid that makes the world a better place in some small way." The farm’s CSA coordinator, Hannah, says this is her favorite soup. It comes from Ricky, one of the cooks in the farm’s restaurant. Halve squashes and scoop out seeds. Roast in oven until flesh is tender when pierced with a fork, about 40 min. Cool and scoop out flesh to make 4 cups. Purée in blender or food processor. Over medium heat, sauté onions, garlic and leeks until they are softened and glassy. Add roasted peppers, delicata purée and stock. Bring to a simmer and cook for 15 minutes. Add cream, cayenne, lemon juice and salt to taste. Stir well to combine. Purée the soup in a blender in batches or use an immersion blender. You can also serve it without blending; the finely sliced onions and slivers of pepper make it quite a pretty soup as is. Note: You can also speed up the process by peeling the delicatas with a vegetable peeler, halving them, scooping out the seeds and chopping them into 1" cubes. Add cubed squash when you add the stock, increase the cooking time to 30 minutes, then purée. 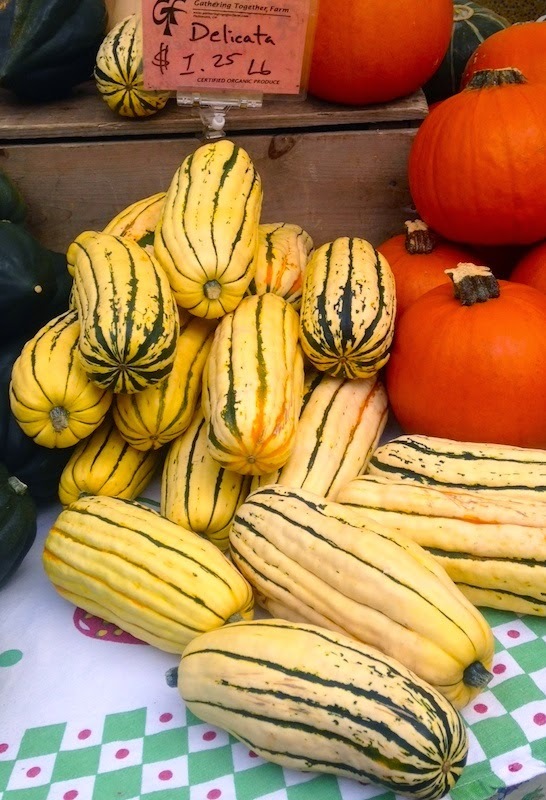 This also works with other types of cucurbitaceae like butternut, acorn, etc. 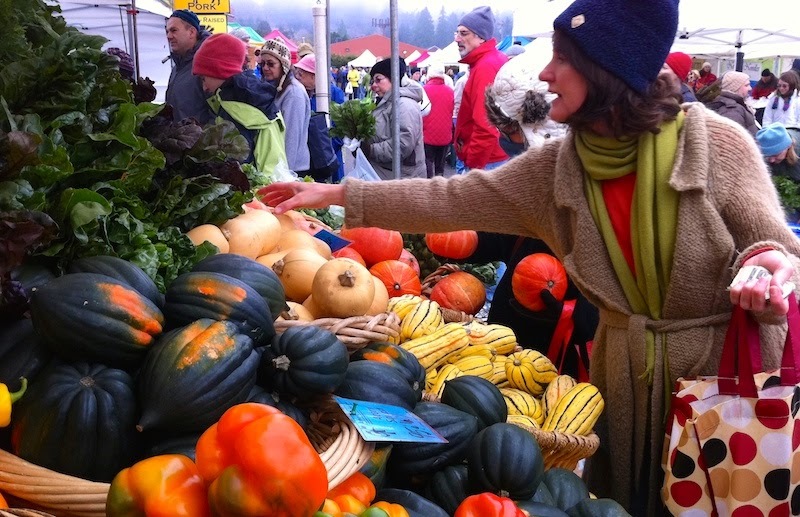 This article was developed in collaboration with the Beaverton Farmers Market, a sponsor of this blog. Top photo of John Eveland by Jake Stangel.